Many of you may remember the scene in the film “Life of Pi”, where the entire sea is lit up as if a thousand small led bulbs have been put on beneath the sea. This is actually true. 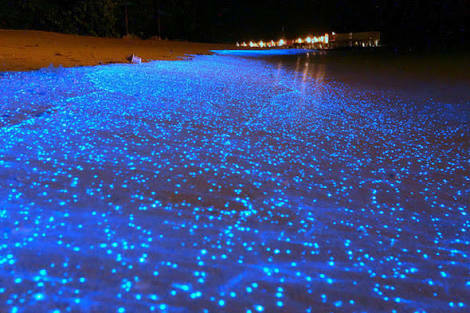 At certain places you can witness a sea of light – the phenomenon is caused by micro organisms that emit light. The spectacle occurs when phytoplanktons (microscopic marine plants), commonly known as dinoflagellates, produce light through chemical reactions in proteins, say researchers. 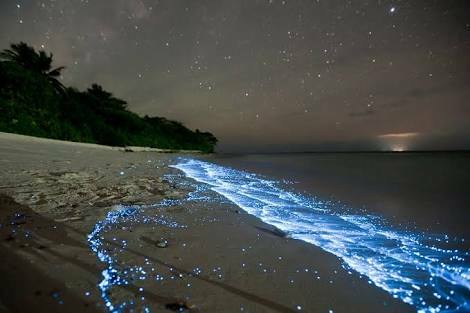 These bio-luminescent beaches have been seen all over the world (Maldives, Vietnam, Indonesia, USA, Australia etc..) and (hold your breath) India. The Central Marine Fisheries Research Institute (CMFRI) confirmed that the occurrence of bioluminescence – emission of light by marine organisms – has been observed at several coastal areas this year. 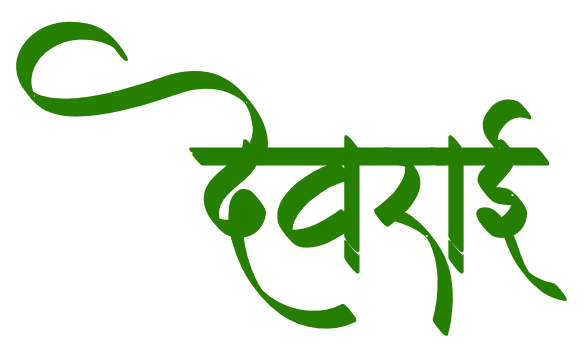 Recently, this was spotted at Juhu beach in Nov 16 and Kelshi, Ganapati Pule beaches in Jan 17. This can be due to several factors for the occurrence but one of the main factors could be eutrophication – the reduction of oxygen in the water, which makes the phytoplanktons pretty dominant. A sample of the water needs to be analysed to check the exact cause of the blue tide. This has been spotted along the Indian coast with increasing frequency,” says E Vivekanandan, consultant and scientist, CMFRI. Locals call the fluorescent occurrence as ‘neeli machli’ (blue fish). They claim that it is not harmful and if one puts their hand into the water, it starts glowing. “While making the light this organism secretes a chemical which is toxic and kills fish in the area the light emerges and are known to occur near the Florida gulf coast. However, in Mumbai’s case, the blue light is not toxic and has maximum transmission in water that helps reach maximum distance,” says Dr Parvish Pandya. While bio-luminescence has been spotted at many beaches across the world, what makes the sight rarer is its complete lack of predictability. So if you are lucky, you may walk down one of the beaches at around 9:30 pm since these are visible under a dark sky and the lights get submerged once the high tide sets in. It may be better to stay away and enjoy the view from a distance although the locals claim otherwise. Better safe than sorry.